4 Does Chicken Go Bad if You Marinate It in Vinegar Overnight? A slow cooker can be a busy person's life saver, busily simmering or cooking dinner while life goes on in other directions. But, sometimes cooking chicken breasts seems to be almost a thing of magic. If you take them off the pan or out of the oven too early, they are still raw; if you take them out a minute too late, they are bone dry. If you are looking for the perfect tender, juicy chicken breast without all the fuss, consider cooking them using a slow cooker. This method of cooking is virtually prep free and can turn out tender and succulent chicken breasts because of the low heat and moist cooking atmosphere. Cooking chicken breasts in a slow cooker will result in tender meat as long as you cook the meat correctly. Always use thawed chicken breasts – never frozen chicken – because the thawing poultry may develop harmful bacteria at low temperatures and it may not cook evenly. Both bone-in and boneless chicken breasts are suitable choices for slow cooking. Remove the skin and trim away visible fat before cooking the poultry. Season the chicken breasts by rubbing them with herbs and spices such as tarragon, oregano, dill or sage or a seasoning mix of your choice. Try splashing a zesty, creamy salad dressing over the chicken to give it tasty flavors. Use chicken broth, spaghetti sauce, tomato sauce or even plain water to cook chicken breasts in a slow cooker. The key to tender chicken breasts in a slow cooker involves adding enough liquid to create a moist cooking environment. Spread the chicken breasts out in an even layer and add enough liquid to almost cover the meat or 1/2 cup of liquid for every one pound of chicken. If you are adapting a conventional recipe to the Crock-Pot or slow cooker, you still need 1/2 cup of liquid per one pound of chicken. Cooking times in conventional recipes have no bearing on Crock-Pot cooking times. Cook the chicken until it reaches an internal temperature of 165°F, or about two to three hours on high or four to five hours on low. Don't cook frozen chicken in a slow cooker, as it will not heat up fast enough to combat the bacteria that can grow on raw chicken. Before serving the chicken breasts, check the internal temperature of the meat with a food thermometer to make sure they’re finished cooking. 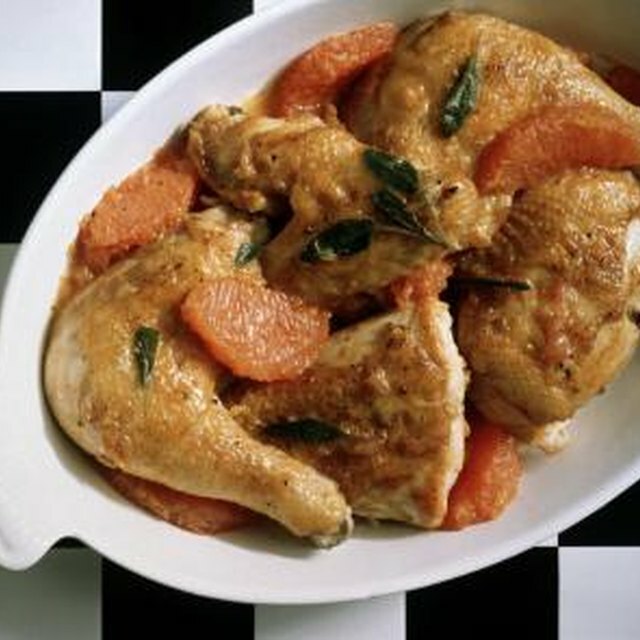 The FDA recommends cooking poultry to a minimum of 165 F or you may risk food-borne illness.